The powder coated iron base has a soft golden hue which matches the oversized squared hardware and emphasizes the impeccable Wheaton Brown finish on our Chest. Three deep drawers provide ample storage, and have extended drawer glides so storing blankets or extra pillows inside will be a breeze. Adding photos or a lamp on top to complete the look? You will love the convenient AC and USB ports on back, because plugging in that perfect lamp has never been easier! 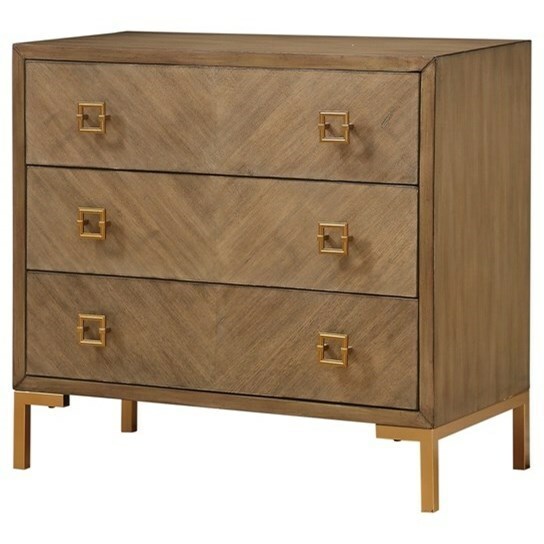 The Coast to Coast Accents Three Drawer Power Outlet Chest with Gold Metal Accents by Coast to Coast Imports at Miskelly Furniture in the Jackson, Pearl, Madison, Ridgeland, Flowood Mississippi area. Product availability may vary. Contact us for the most current availability on this product.